If you're a Cold Stone Creamery pro, you know better than to mess around with a flavor that isn't Birthday Cake Remix. The fudge- and brownie-blasted cake batter ice cream covers all the important dessert groups, and has been proclaimed the best thing on the menu by esteemed experts. And now, you can make a version that doesn't melt. 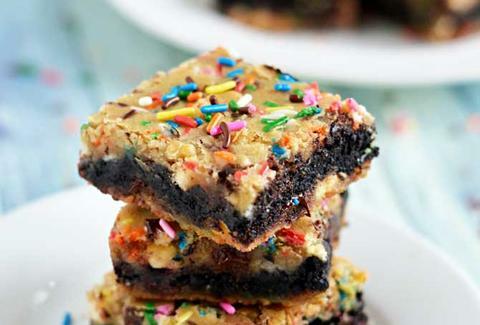 Host the Toast's Birthday Cake Remix Brownies incorporate the "birthday cake" part through a blondie top layer with serious vanilla flavor and sprinkles, while the bottom layer is all fudgey brownie business. Add a side scoop of ice cream and prepare for your taste buds to explode... much like that vat of Coke, after the Mentos man jumped in. Kristin Hunt is a food/drink staff writer for Thrillist, and is awaiting feedback on her Cold Stone composition of "You Only Live Ice". Follow her at @kristin_hunt.